In January, on an Instagram post, I asked what peoples’ favorite Japanese dishes were. It was really fun to see the responses. One of the responses was from @sandrajapandra who said that saba no misoni was her favorite. 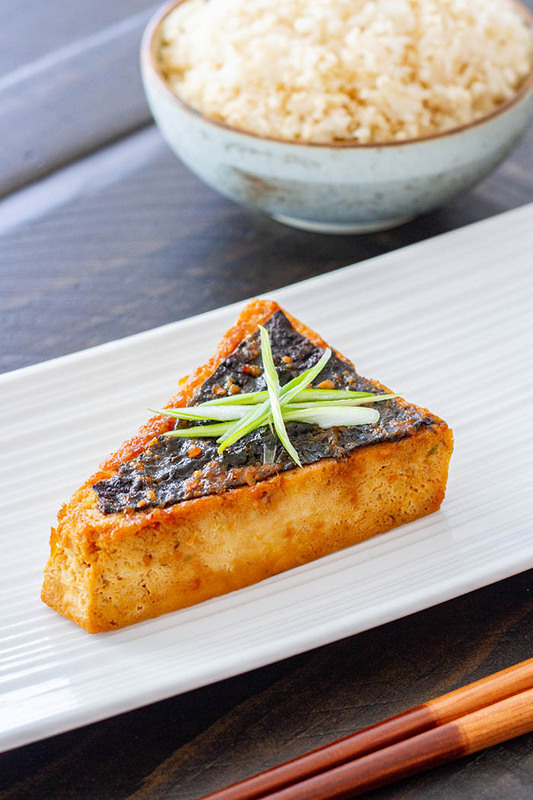 Saba no misoni is a very traditional Japanese fish dish of mackerel that is simmered in a miso sauce. I haven’t had it in ages, but once I read that response I couldn’t get it out of my head. Then the wheels started turning and a few days later I started working on a recipe that used tofu “fillets” in place of mackerel. This recipe is the result. I don’t have much to say about it, other than it’s delicious and a great way to shake up your tofu game. The prep of the tofu takes a couple of days, so make sure you take that into account when you are making it. That may sound intimidating, but it’s not, I promise! You start by freezing, then thawing the tofu, which changes the cellular structure of the tofu, lending it a more fish-like texture. You can skip this step if you like and it will still be delicious! 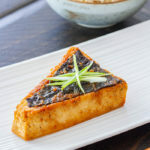 This take on a traditional Japanese fish dish, uses tofu fillets in place of mackerel. 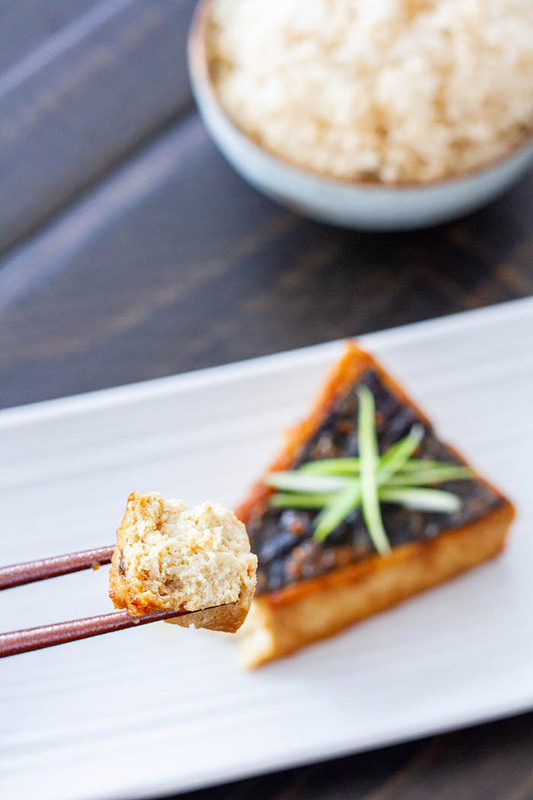 Marinated tofu is simmered in a savory miso sauce for a delicious main dish. Delicious served with steamed rice and a side of grilled/roasted/steamed vegetables. The prep of the tofu takes a couple of days, so make sure you take that into account when you are making it. That may sound intimidating, but it's not, I promise! You start by freezing, then thawing the tofu, which changes the cellular structure of the tofu, lending it a more fish-like texture. You can skip this step if you like and it will still be delicious! Drain the tofu and pat it dry with a clean dish towel. Wrap it in a layer of plastic wrap and then a layer of aluminum foil. Freeze in the freezer for 24 hours. Thaw in the refrigerator. Do not unwrap the tofu, but do place it, wrapped, in a container, as it may leak liquid. Thawing may take up to 2 days. When the tofu has thawed completely, unwrap it and shake off the excess liquid, then press the tofu by placing it on a large plate lined with several layers of paper towel. Put several more layers of paper towel on top, then place a cutting board on top of that. Weight the cutting board down with something like several cans of food or a book and let the tofu press for at least 30 minutes (preferably several hours). Once the tofu has been pressed, cut in half, so that you have 2 thinner pieces of tofu. Cut each half into 3 pieces. If you angle your cuts it can give them a shape more reminiscent of a fish filet, if you like. Put the tofu fillets in a large bowl. In a small bowl, mix together the marinade ingredients, then pour the marinade over the tofu fillets. Fill the rest of the bowl with water, then gently move the tofu pieces around slightly to mix everything together. Cover the bowl and set it in the refrigerator and let the tofu marinate for 2 to 4 hours. Preheat the broiler and line a baking sheet with parchment paper or a silicone baking mat. When you are ready to cook the tofu, carefully remove the tofu fillets from the marinade and gently wipe any excess marinade off, then set the fillets on plate. 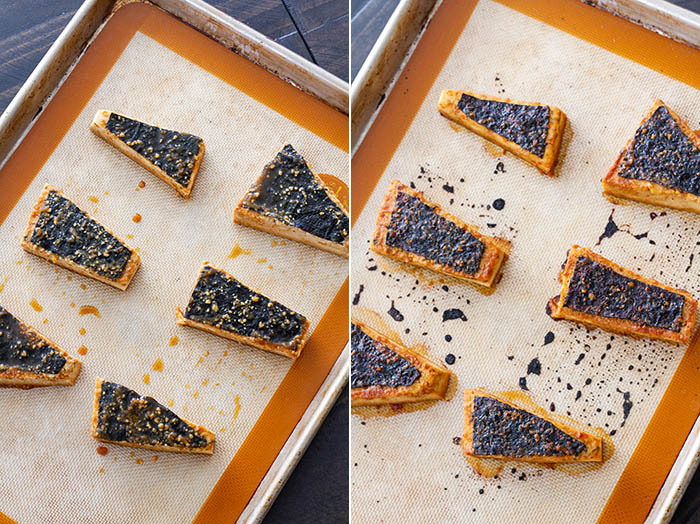 Cut the sheet of nori into pieces that fit on top of each tofu fillet, then set a trimmed piece of nori on top of each tofu fillet, rough side down. In a small bowl, mix together the miso paste, soy sauce, mirin, coconut sugar, and grated ginger until it is well combined. Then slowly add the water until it is all evenly mixed together. Pour the miso sauce into a large saute pan and place the saute pan over medium heat. When the mixture comes to a boil, place the tofu fillets in the skillet, nori side up. Put a lid on the saute pan and reduce the heat to medium-low. Let the tofu fillets simmer for 10 minutes. Take the lid off, then use a spoon to spoon some of the miso sauce over the fillets, repeating several times before removing from the heat. Set the filets on the prepared baking sheet and put them in the broiler briefly, until the edges start to brown. Serve immediately, garnished with thinly sliced green onion.